Fame, fortune, and the rock star lifestyle are just a few of the perks of being a legendary guitarist. And if you’re anything like these guitar heroes, then a penchant for luxury watches is a thing too. 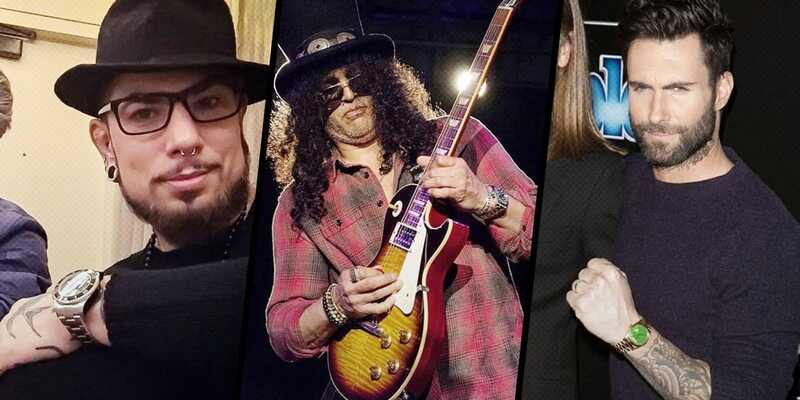 Here’s a roundup of some of the most renowned celebrity guitarists and the Rolex watches that grace their talented wrists. Aside from his music and incredible guitar skills, John Mayer is well known in the watch enthusiast community for being a watch collector himself. He’s even contributed some articles to Hodinkee and is very vocal about the watches he likes and does not like. And among the watches John Mayer does like is a bunch of awesome Rolex timepieces. Some of John Mayer’s vintage Rolex watches include a Submariner COMEX ref. 1680, a MilSub ref. 5517, and a Daytona ref. 6263. Along with vintage pieces, he also has a couple of very modern Rolex watches to his name including the white gold GMT-Master II with the famed Pepsi dial. It’s worth mentioning that John Mayer was one of the first in the US to receive 2016’s hottest watch of the year—the steel and ceramic Daytona ref. 116500LN. He opted for the white “Panda” version instead of the black dial model—and it looks great! It may come as a surprise to some, but guitarist, singer, songwriter, and tattoo aficionado Dave Navarro of Jane’s Addiction and Red Hot Chili Peppers fame is a big fan of high-end watches too. Within his collection of luxury watches, we spotted some fantastic Rolex watches on his wrist. Similar to John Mayer, Dave Navarro was also an early recipient of the popular steel and ceramic Rolex Daytona in 2016 and the Panda dial is the version he selected. Dave Navarro’s other Rolex watches include an 18k yellow gold Day-Date President with baguette diamonds on the champagne dial, a steel GMT-Master II with the blue and black “Batman” bezel, a two-tone steel and yellow gold Submariner, a Yacht-Master II, and a Deepsea dive watch. From dressy to sporty, his choice in Rolex watches is certainly diverse. With his signature top hat, crazy hair, history with Guns N’ Roses, and immense guitar talent, there are few guitarists the world over that are as recognizable as Slash. And what does a celebrity guitarist like Slash wear on his wrist? The Rolex Submariner “Hulk.” named so for its bright green bezel, chunkier stainless steel Oyster case, and rich green dial. Slash rocked his Rolex Submariner Hulk on stage just this month at the LA Zoo’s Beastly Ball, where he headlined the fundraiser for the zoo! Just like his go-to black top hat, Slash seems loyal to just one Rolex watch. Eric Clapton’s love affair with high-end watches goes back several decades. In fact, in the 1990s, Eric Clapton—without a doubt one of the greatest guitarists of all time—was an official Rolex ambassador appearing in several print ads for the Day-Date President. Eric Clapton’s passion for watch collecting really came into the spotlight after he sold off some extraordinary pieces at auction including a vintage Yacht-Master prototype (one of only three ever made) and a vintage Daytona ref. 6263 “Albino” that sold in 2015 for $1.4 million—the most expensive Rolex ever sold at the time. He also sold his yellow gold Daytona just last year, which he wore on a black rubber strap. These days, we’ve seen Eric Clapton wearing a bunch of other Rolex watches including the modern MIlgauss with the green sapphire crystal, a stainless steel GMT-Master II, and most recently, an unassuming stainless steel Datejust in this video interview with the Royal Albert Hall. Frontman for Maroon 5, solo artist, and celebrity judge on NBC’s The Voice, Adam Levine has a very interesting Rolex collection packed with vintage classics. Adam Levine’s Rolex collection includes vintage Daytona chronograph “Paul Newman” models in steel and yellow gold, vintage Daytona watches with regular dials, a vintage Submariner with no crown guards, a host of vintage Day-Date watches with colorful “Stella” dials, and a vintage yellow gold GMT-Master, just to name a few. With pieces like these, it’s clear that Adam Levine is a serious and thoughtful Rolex watch enthusiast with a taste for the old school. Given the wide choice of models, from old to new, tool watch to dress watch, it’s no surprise that the appeal of Rolex watches is widespread. And if this article has shown us one thing, it’s that a Rolex looks fab paired with tattooed arms!